Genetics; Social aspects; United States. Amazon.com description: Product Description: We know DNA is a master key that unlocks medical and forensic secrets, but its genealogical life is both revelatory and endlessly fascinating. Tracing genealogy is now the second-most popular hobby amongst Americans, as well as the second-most visited online category. This billion-dollar industry has spawned popular television shows, websites, and Internet communities, and a booming heritage tourism circuit. For over a decade, Nelson has studied this phenomenon. Weaving together keenly observed interactions with root-seekers alongside historical details and revealing personal narrative, she shows that genetic genealogy is a new tool for addressing old and enduring issues. 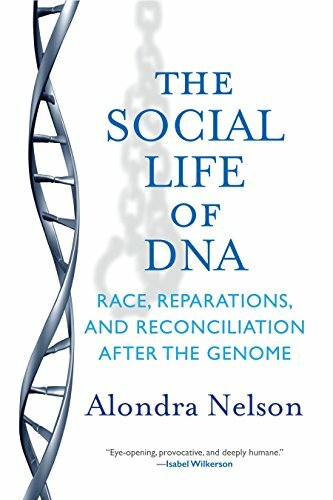 In The Social Life of DNA, she explains how these cutting-edge DNA-based techniques are being used in myriad ways, including grappling with the unfinished business of slavery: to foster reconciliation, to establish ties with African ancestral homelands, to rethink and sometimes alter citizenship, and to make legal claims for slavery reparations specifically based on ancestry. Nelson incisively shows that DNA is a portal to the past that yields insight for the present and future, shining a light on social traumas and historical injustices that still resonate today. Science can be a crucial ally to activism to spur social change and transform twenty-first-century racial politics. But Nelson warns her readers to be discerning: for, the social repair we seek can't be found in even the most sophisticated science. Engrossing and highly original, The Social Life of DNA is a must-read for anyone interested in race, science, history and how our reckoning with the past may help us to chart a more just course for tomorrow. About: We know DNA is a master key that unlocks medical and forensic secrets, but its genealogical life is both revelatory and endlessly fascinating. About: The unexpected story of how genetic testing is affecting race in AmericaWe know DNA is a master key that unlocks medical and forensic secrets, but its genealogical life is both revelatory and endlessly fascinating. With Han Suyin | Reprint edition from Bantam Books (January 1, 1986); titled "The Enchantress"